On February 2, 2019, the United States (US) began the process of withdrawing from the Intermediate-Range Nuclear Forces (INF) Treaty. The Secretary of State announced that “unless Russia returned to full and verifiable compliance in 60 days, the United States would suspend its obligations under the Treaty.” Following the US’s policy change, the President of Russia also suspended Russia’s involvement in the INF Treaty. President Reagan and General Secretary Gorbachev signed the INF Treaty on December 8, 1987. The treaty required the US and Russia to eliminate from their military arsenal all ground-launched ballistic and cruise missiles with ranges of 500 and 5,500 kilometers, as well as any launchers and support equipment. However, for the past several years, Russia has not abided by the INF Treaty. In 2014 the US accused Russia of violating the treaty by testing ground-based cruise missiles and in 2017 Russia was accused of deploying a prohibited cruise missile. Russia’s continuous noncompliance with the INF treaty contributed to the US’ decision to withdraw from the treaty. The collapse of the INF treaty combined with the increased militarization around the globe increases the risk of armed conflicts between countries. According to the Stockholm International Peace Research Institute, world military expenditure in 2017 reached the highest level since the end of the Cold War. Moreover, the US, China, Saudi Arabia, Russia, and India all allocated over $60 billion to their respective armed forces in 2017. The US outspent every nation by investing $610 billion on its military forces in 2017. Considering how a global arms race is imminent, Senator Elizabeth Warren’s No First Use Act provides an important military position to prevent miscommunication between the US and its adversaries regarding nuclear weapons. The No First Use Act would make “US policy not to use nuclear weapons first.” Consequently, the US would be unable to initiate a nuclear attack, even if an adversary has already started a military conflict through a non-nuclear strike. Some may argue that a no first use policy disadvantages the US by preventing the country from using nuclear weapons while other nations still have the option of initiating a war against America with nuclear weapons. 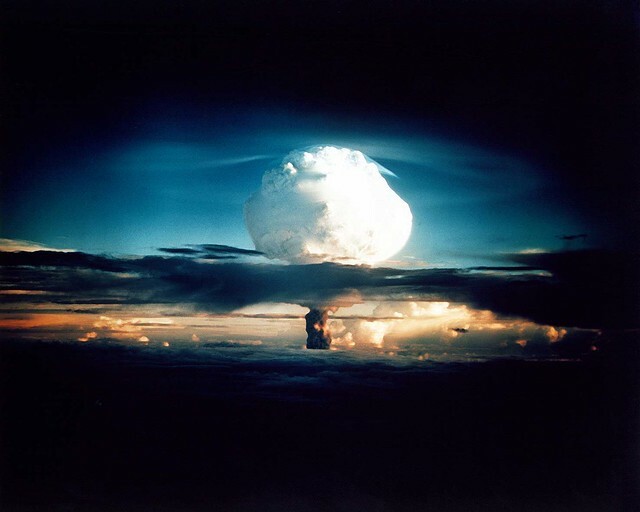 However, by communicating to the world that its domestic law prohibits the US from employing nuclear weapons first, the likelihood that adversarial states use a nuclear weapon first decreases. Adversarial states no longer need to be concerned that the US will initiate a preemptive attack with nuclear arms. Moreover, even if the No First Use Act is enacted into law, the US does not lose its nuclear deterrent. The mere possession of a nuclear weapon is enough to deter adversaries from using nuclear weapons because of the doctrine of mutually assured destruction. So long as a country that initiates an attack is unable to destroy all of the other country’s nuclear weapons in one strike, the country that has been attacked can retaliate with its own nuclear strike. Thereby, assuring mutual destruction. For this reason, it is important that the US maintain a strong nuclear triad so that it can always have an effective nuclear deterrent. Concepts such as nuclear deterrence and mutually assured destruction, however, assume that all international actors act rationally and fear their own destruction. This assumption may not apply to non-state actors such as terrorist organizations. This is especially true for non-state actors that have no fear of causing death to their own followers. As such, it is in the interest of all nation-states to prevent non-state actors from acquiring nuclear capabilities. With the collapse of the INF treaty, the increased militarization around the world, and the infringement on the US’ political sovereignty by Russia during the 2016 election, it is fair to say that the likelihood of armed conflict or a twenty-first-century cold war has increased. The challenges that the US faces in the area of foreign policy makes it imperative that the US makes strategic investments in research and development while also reemphasizing its commitment to the prevention of nuclear war by making it clear to its adversaries that it will not initiate preemptive nuclear strikes.